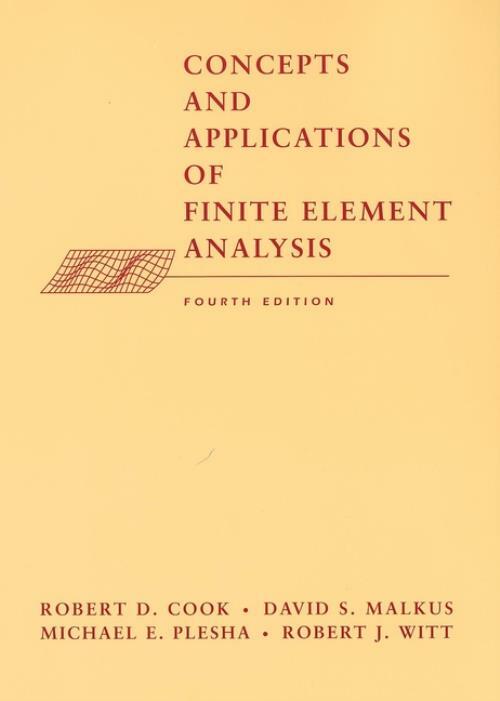 This book is an accessible introduction to finite element analysis. The exposition moves gradually from simplke concepts to more advanced theory, with the goal of making competent applications based on sold understanding. In addition to theory, considerable attention is given to practical matters: modeling for finite element analysis, checking computed results for errors, and revising an analysis as needed. Basic theory is clearly explained. Includes over 500 analytical problems. Dynamics, nonlinearity, and heat transfer are treated. Includes application examples with solution critiques. Any finite element analysis software can be used with this book. Formulation Techniques: Galerkin and Other Weighted Residual Methods. Coordinate Transformation and Selected Analysis Options. Error, Error Estimation, and Convergence. Modeling Considerations and Software Use. Finite Elements in Structural Dynamics and Vibrations. Heat Transfer and Selected Fluid Problems. Constaints: Penalty Forms, Locking, and Constraint Counting. Appendix A: Matrices: Selected Definition and Manipulations. Appendix B: Simultaneous Algebraic Equations. Appendix C: Eigenvalues and Eigenvectors.